This time of year, although busy and sometimes hectic, also gives us the opportunity to visit and spend time with those we love and hold dear. 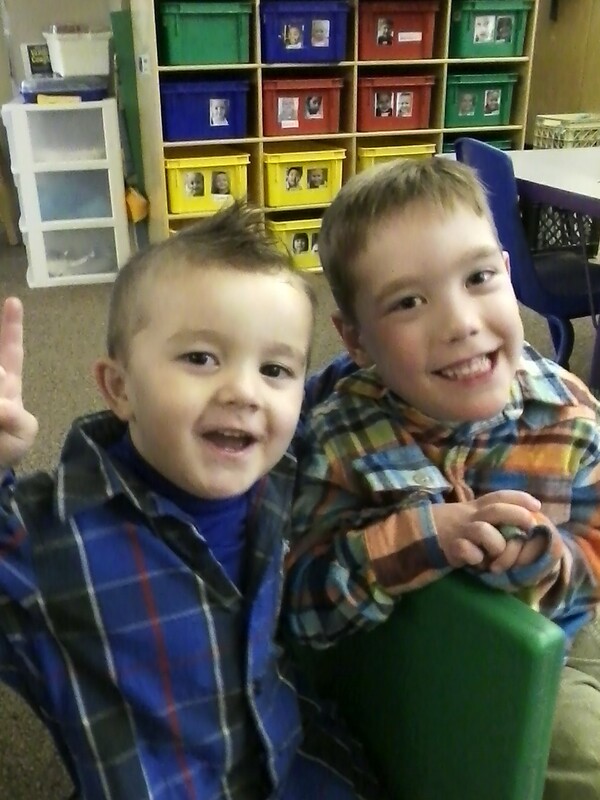 Cameron finished up his last week of school before winter break and one of the buddies in his class showed up sporting a handsome flannel shirt too! 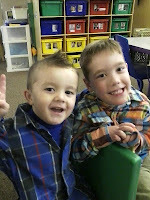 We have to pass along a special thanks to Miss Kathy for capturing the pic of the friends. Cam's 'Auntie Amanda' and 'Uncle Mark' drove in from Ann Arbor to hang out with the family for a couple of days. Cameron showed off his walking skills and using the Ipad. Amanda and Mark were very impressed! The families also exchanged gifts and the U of M collection of clothes was perfect for these football fans! Cameron has a sweet looking Michigan warm-up suit that he promptly wanted to put on the minute he opened it. Saturday was a celebration with Auntie Jo and Will. The boys both asked for books for Christmas and both must have been very good guys because Cam and Will received some great reading material. Many thanks to our Auntie Jo and Will for a delicious lunch and quality time spent with two of our favorite people! Sunday marked the day of the annual Jellema Cousins Christmas Party. For the very first time, it was held at Cam's house! This event has taken place for over 30 years and every year there is usually more than 30 relatives making an appearance. Besides the good company, food and cheer, this celebration includes a special guest- Santa! While the children are busy in another room, sleigh-bells are heard and Mr. Claus appears with presents for the younger generation. Everyone had a chance to sit on Santa's lap and the white-bearded man graciously answered such questions as "why were you at the mall?" and "did you have a rough trip?" Our littlest baby cousin, Gavin, even let Santa hold him without any protest! A special gift that Cameron is shown holding is from cousin Annie- a blue stuffed animal that says "my little monkey" which has always been Annie's nickname for her Cam. Our cousins, aunts and uncles are so very special to us and we're grateful for the opportunity to share the spirit of the season with them all!